$5.96 Winco K-14S Sharpening Steel 14"
$10.01 Winco K-34S Premium Round Sharpening Steel 14"
$11.10 Winco K-54S Premium Sharpening Steel 14"
$12.19 Crestware CBS14 Chrome Butcher Steel 14"
Hardy and durable, this sapphire cut dickoron steel is high quality and suitable for professional use. With it you can maintain and keep your knife collection sharp for a variety of kitchen tasks. 14" in length, it is equipped with tiny sharpening grooves over its entire surface. Round shaped, it is ideal for honing knife edges. For added safety, it is crafted with a plastic handle to protect against hand strain. When not in use, simply hang it on the wall by its ring hook. I received this honing steel about a month ago, along with the FDick 12" Premier Plus Chef knife, and it has done an excellent job keeping the edge on the knife sharp. The edge is sharper now than when the knife came out of the box, without doing any touchup with a whetstone. I would describe the sapphire cut on this steel as medium-fine. It is not as aggressive as other medium-cut steels I've seen, removing only a small amount of metal when honing (though more than the FDick Micro Steel). In the process, carving small micro-serrations in the edge which helps the knife cut better through produce with tough skins - like tomatoes or bell peppers. This steel is well suited for German steel knives on the upper end of the hardness spectrum, where a coarser steel will chip the blade edge. Despite its length, this honing steel feels very light and it's easy to handle when working with it. Using a round instead of oval configuration on the surface keeps the weight down. While oval configurations perform better in fine-cut and smooth steels, I have not noticed a difference with coarser cuts. Honing surface length: 13 3/4"
+Sapphire cut is finer than that in other steels I've seen. 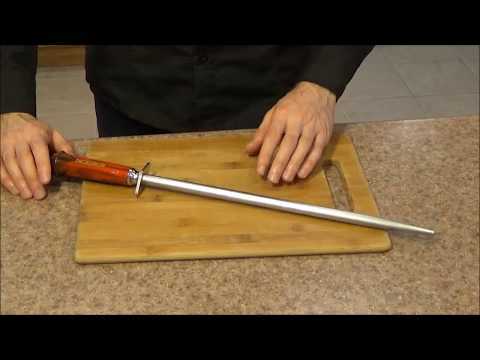 +The longer honing surface length makes it ideal for knives up to 12". +Light for its size. Using a round surface instead of oval reduces weight. +Durable hardened steel. No signs of wear after over a month of use. 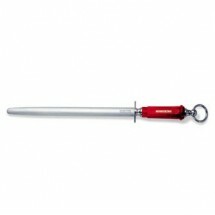 +-The protective bolster on the handle is metal. If you're new to using a honing steel, be careful not to hit it with your knife. While it will protect your hand if you hit it, you'll end up with dents in your edge. +-Because of its size, this steel will not fit in most drawers. I suggest using the loop on the handle to hang it instead. +No dents or scratches in the honing surface. +No chips or scratches on the handle. +I had a hard time finding a comparison product. The closest I could find available in 14" is the Wusthof Beehive, at $95. It is slightly higher cost, and rated a lower hardness, HRC 65.